Firstly, Don't forget next Sunday 1st October we meet in the car park at 2.30pm for our fungus foray, Tony Boniface, the leading Essex specialist will guide us round and hopefully find fungi galore. This event will take place no matter what the weather. So I will see you there with your brolly. On Friday 21st July 14 members set off in the dark to see Glow-worms in Laindon and we did. We all had good views of several females, the first I've ever seen so well worth while. On the Beauty Spots of Harold Hill there has also been significant developments, you will recall that our second attempt to get the council to honour their obligations was on the Whitchurch Rd allotment site, after several attempts the council managed it and removed a huge amount of rubbish. The whole saga lasted about six weeks. We then moved on to Leamington Rd Woods (Shoulder of Mutton Wood) which hadn't been litter picked for more than ten years, if ever. Anyway we wrote to the council on 16th May pointing out that the wood was an eyesore with a large amount of wind blown litter as well as fly tipped garden refuse old tyres and furniture etc and that under the Environmental Protection Act of 1990 the Council had a statutory duty to keep all of their land free of litter. The Council's response was a simple acknowledgement on the 24th May, we waited another couple of weeks and on the 11th June we wrote again asking for a reply to our first letter and threatening court action. On the 16th June we received another holding letter and on the 3rd of July a letter arrived claiming that the clear up was complete. I returned to the wood on the 9th July to inspect the results of the clear up and was appalled to find that the wood was in the same condition as when I first visited it in early May. A cursory attempt had been made at clearing the vegetation between the boundary fence and the public highway, this seems to have been done mechanically and the large amount of refuse amongst the vegetation was left there in a shredded condition. It looked worse in fact because rubbish which was once partly concealed by vegetation was now clearly visible. Beyond the boundary fence no litter or fly tipping had been cleared whatsoever, a pile of old tyres still in situ and an old armchair was in the same position albeit now partially burned. I wrote immediately to the council pointing out that their clear up attempt was a hopeless failure and I informed them I would be visiting the Magistrates Court the following week for preliminary discussions. Having heard nothing from the Council by the 17th July we wrote giving formal notice that we would be in court applying for a litter abatement order on the 24th. Still nothing was heard from the Council so on 24th July we went to court and obtained a summons against Havering Council to appear for the first hearing on the 24th August. On the 9th August a letter arrived regretting that we had gone to court and informing us that they had done another clear up. Off I go to the woods again this time accompanied by Dennis Cook and one of the newly elected Councillors, Dennis Bull. You will not be surprised to know that there had only been a minor improvement. Cllr Bull also agreed it was not of an acceptable standard. On the 17th August I wrote for the fifth time suggesting that it was not good enough and if a senior officer were to meet prior to the court case we may be able to avoid the legal action. On the eve of the case they made contact and agreed to meet on site, with hours to go I asked the court to set a new date to allow time for discussions. A new date for the hearing was set for 21st September. I met with Geoff Pepper and Don Stewart and they agreed to make yet one more attempt. Over the following three weeks some more work was done in the wood and following that I met Don Stuart and Mr Hines on 20th September (The council love a bit of brinkmanship) we all agreed that work still needed to be done and the following programme was agreed. 1. Before the end of this year work will be undertaken to cut back the vegetation two metres into the wood all along the boundary of both Leamington and Stratton Roads. 2. The litter will be cleared from that area. 3. The Wood will thereafter be litter picked on a monthly basis. 4. The Council will also maintain the verges on the footpath side of the fence keeping it free of nettles, brambles and litter, in the hope that it will eventually grass over enabling it to be maintained by routine mowing. A day before the hearing at the Magistrates Court I finally withdrew the case and the council agreed to pay our costs. Some thanks are due to two people not already mentioned, firstly Phil Butler for bringing to my attention the provisions of the Environmental Protection Act 1990 and secondly to Peter Jones for attending court with me and his general support and encouragement. Peter is currently pursuing his own battle with the council on the rubbish in Sage Wood which runs down from Dagnam Park Drive, across Wickford Drive then Swindon Lane and on into Central Park. On a separate but connected issue, in August I pointed out verbally that our next case would be the small area of woodland on the junction of Whitchurch Rd and Dagnam Park Drive, to their credit the council took that on board and cleared a large amount of rubbish, they have also agreed to keep it clear by litter picking it 18 times per year. Members will be well aware that we have campaigned for a couple of years now for steel fencing around the park and to give them credit the council have done it, its not perfect, but then things never are. See below copy of an Email sent to Pete Williams, the boss of Havering's Countryside Management Services on 24th September 2006. He has not yet had time to reply. Obviously to have spent such a large amount of money to little effect is somewhat embarrassing. I spoke to Geoff Pepper more than a month ago and he told me that in fact the wrong restrictors were installed by the contractors and that they were to be changed, I hope that that is the case, perhaps you can enlighten me. There is a similar problem in Lower Noke Close where the whole project is simply being bypassed at one end, I even saw horses and riders using that diversion a few weeks ago. When we last spoke you assured me that you had that problem in hand. Finally you will recall my previous email on the missing/vandalised section of the new fence in Priory Rd. Please advise when will that be repaired? The contractor is replacing the restrictors and they are currently on order. The fencing at Priory Road is being repaired and modified with the inclusion of a pedestrian squeeze structure and a report is going to the 17 October Harold Hill Community Area Committee regarding access and the fencing at Priory Close following the submission of a petition from local residents. We, through Geoff Pepper, will be extending the ditch to the end of the fencing and installing a small pedestrian culvert bridge where the new access will be provided, at that time we can consider cutting back the vegetation. I would be happy to have a site visit with you to look at the pros and cons of this! Denis, our green Belt Ranger, is going to fence up the gap at Lower Noke Close, Alan will ask him to bring this forward in his priorities. It would be useful if we could organise an indoor meeting soon, if enough members are present at the fungus foray we can try to fix a date then. Many of those reading this would have had their gas cut off in early February. The shut down affected about 2,500 people at the Dagnam Park end of the estate and was spread over several days.On the 3rd of February you would have received a letter from National Grid (formerly Transco). National Grid is responsible for all gas pipelines etc. That is not the same as the energy supply companies like British Gas or Powergen these are the companies that send you your gas bills. 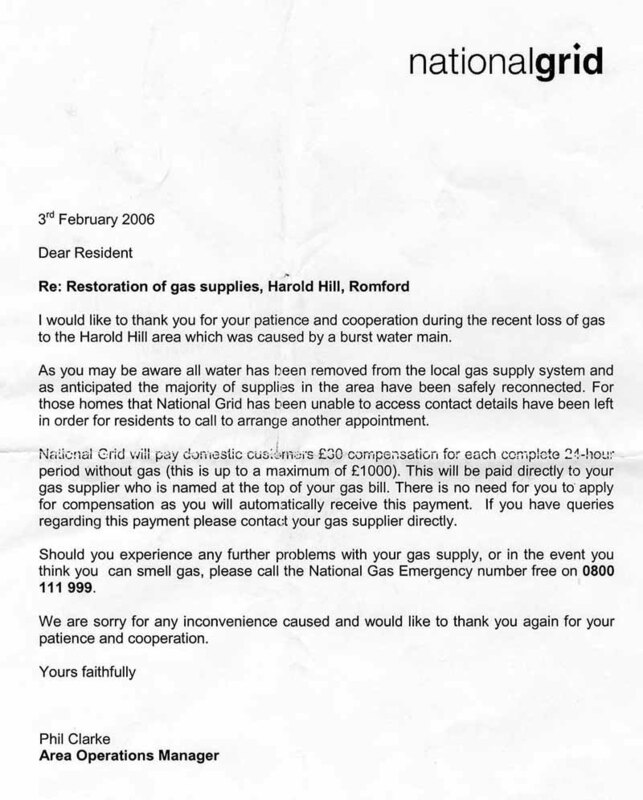 This letter states that you will receive "compensation at £30 for every full 24 hour period without gas" It also states that "there is no need for you to apply for compensation as you will automatically receive payment" Some hope, I waited 4 months and then contacted my supplier Powergen they said no, it was down to National Grid to pay me. So I contacted National Grid and they said it was definitely down to my supplier, Powergen. After some more checks I got back to Powergen who eventually agreed it was their responsibility to pay but they couldn't because National Grid had not supplied them with the required list of customers that qualified for compensation. They did say that National Grid would make me a one off payment but I said I would prefer to be paid at the same time as everyone else by the standard procedure and that I would wait whilst Powergen acquired the necessary authority from National Gas. Well I waited and I waited and two weeks ago I contacted Robert Goode (Robert.goode@powergen.co.uk) at Powergen and asked where was my cheque, He said he would look into it and he did and he came back and said that they still had not had the lists from National Grid and that he had ascertained that I could contact National Grid direct for a payment. I said I wouldn't do that. There were thousands of other people involved many elderly and many on low incomes and many were probably unaware of their entitlement and I was interested in all of us getting the payment. Well he took that onboard, and ignored it by applying to National Grid for a one off payment on my behalf. I have since had a letter from National Grid informing me that my cheque is in the post. I tried to interest the Romford Recorder in the story several months ago but they declined to publish anything, as I write I am in the process of trying to interest a National Paper in the story. I am not sure how compensation is calculated because I have seen two different methods quoted, in any case the amount due to us is two days at £30 per day. This payment should be made to you by cheque and not simply deducted from your bill. I will be interested to hear of any other experiences on this matter good or bad. You should be able to find the telephone number of your own gas supplier from the top of any recent bill.